The story laid out in Live Wire was started in a novella that I read several months ago. It blew me away, especially the end when Vivien Montgomery was killed and her boyfriend Chase was left devastated by the loss. I remember reading the end and thinking, "That can't be it." Thankfully, that was not it. 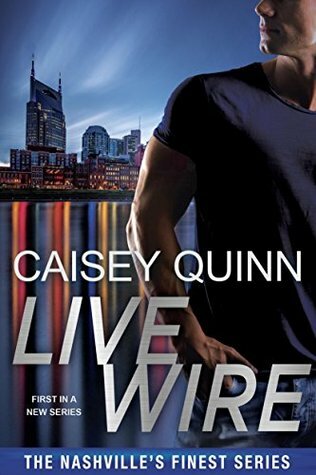 Live Wire picks up four years later, as we learn that Vivien in fact did not die, but was taken in by the feds and put undercover to bring down some really bad people. When she was done her assignment, she was too afraid to go back to Chase in case he was so angry she lied to him he wouldn't speak to her. But now her hand is being forced and she is about to come face-to-face with the man she never stopped loving. And she has no idea how he's going to take it. Needless to say, Chase doesn't take her return from the dead well. My heart absolutely broke for both of them. Chase was obviously feeling horribly betrayed because she never told him she was alive. Vivien is a mess because Chase is being so openly hostile toward her. I can understand both points of view. Neither Viven nor Chase are completely innocent of wrong. I knew that Vivien's return was going to be emotional, but I was surprised by all the feels. Caisey Quinn did a wonderful job connecting me with both main characters. I was right in the story with them as they tried to figure out a way to work together again amidst all their past baggage. To make matters even more complicated and stressful, there's someone after Vivien and Chase automatically steps in to protect her. Thankfully, they don't spend the entire book being hateful with one another, so there's still plenty of sexual chemistry and hot times between the sheets. We get to spend a bit more time with Chase's fellow bomb squad members and get to know them in advance of their own books coming out. I'm really loving what I'm seeing and can't wait to see what their stories will bring. Because this one? Chase and Vivian's story? It was pretty epic.